According to the Ferrari IPO filing, the company aims to raise $860 million by offering 17.2 million shares. At the high end of the price range, the Ferrari IPO valuation would be $9.8 billion. That valuation is a hefty 33 times larger than the luxury automaker's total 2014 earnings. Because of its "luxury" brand, Ferrari Chairman Sergio Marchionne has said Ferrari is worth at least 10 billion euros ($11.4 billion). And he wants Ferrari to be priced as a high-flying luxury goods stock. Like many luxury brands, Ferrari appears recession proof. 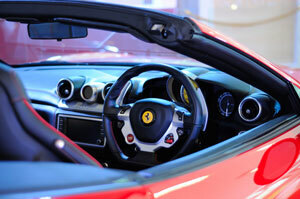 During the 2008 Great Recession, Ferrari booked only a modest 5% drop in cars sold. But not every analyst is on board with that huge valuation. According to CNBC, many on Wall Street think Ferrari is worth about half of Marchionne's estimates. The Italian company has shown solid growth in part because it doesn't just sell its signature cars. It also manufactures Maserati engines and licenses its brands for a variety of items. Both are key to sales and helped revenue climb in 2013 despite lower car shipments. Here's what the Ferrari IPO filing with the U.S. Securities and Exchange Commission tells investors. Ferrari deems itself a luxury car company. The word "luxury" appears 151 times in its IPO filing. Some 57% of Ferrari's non-current assets – a company's long-term investment or materials – consists of brand value. This comes from the value of the Ferrari name, copyrights patents, and intellectual property. These are intangible assets and have no physical value.